The city of Kingsport implements a Construction Site Stormwater Run-off Pollutant Control program. The goal of this program is to reduce pollutants present in stormwater run-off from construction sites. This is accomplished through an ordinance and enforcement response plan (ERP), and in accordance with the city’s NPDES (National Pollutant Discharge Elimination System) Permit and Construction General Permit (CGP). These regulations apply only to land disturbing activities of 1 acre or larger (or less than 1 acre if part of a larger plan of common development). However, smaller individual sites are required to submit an Erosion Prevention and Sediment Control Plan. The city requires developers to submit an application (Notice of Intent) and a Stormwater Pollution Prevention Plan (SWPPP) for review by city staff. 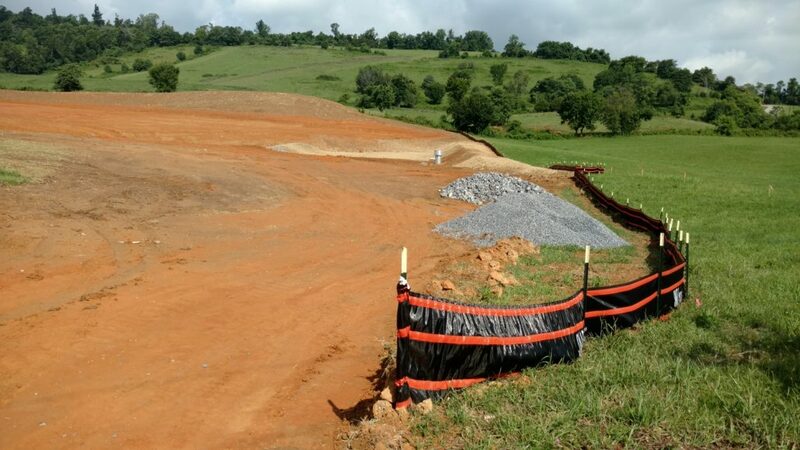 The SWPPP must include best management practices in accordance with the TDEC (Tennessee Department of Environment & Conservation) Erosion Prevention & Sediment Control (EPSC) Handbook. Examples of erosion prevention and sediment control practices are shown below. If plans are approved, the city will issue a permit (Notice of Coverage) which allows the applicant to begin construction activities. A pre-construction meeting is held between city staff, developers and contractors, prior to land disturbance. A minimum monthly inspection frequency of active construction sites is required. Once construction is complete and the site is permanently stable, a Notice of Termination (NOT) can be submitted for review and approval. City construction site inspectors must maintain certification under the Tennessee Fundamentals of Erosion Prevention & Sediment Control, Level I. Construction site plan reviewers must maintain certification under the Tennessee Erosion Prevention & Sediment Control Design Course, Level 2. An inventory of actively permitted public and private construction sites is maintained by the city, as well as documentation of pre-construction meetings and site inspections. The public can access plans upon request.